Leupold® Long Range/Tactical riflescopes are arguably some of the most dependable, highest performing riflescopes you'll find anywhere. Their accuracy is proven in the field. Their rugged and absolute waterproof integrity is unquestionable. They are everything a long-range competitive shooter, target shooter, or hunter could ask for. Leupold Mark 4 3.5-10x40mm Long Range / Tactical ( LR/T ) M2 Illuminated Reticle Rifle Scope 67940 features an illuminated reticle control dial and M2-style adjustments that are specially calibrated and interchangeable for bullet drop compensation. A 30mm maintube design of Leupold Rifle-scope offers additional windage and elevation adjustment. The M2 style 1/2 MOA adjustment knobs with audible and tactile clicks allow that adjustment to be made quickly. 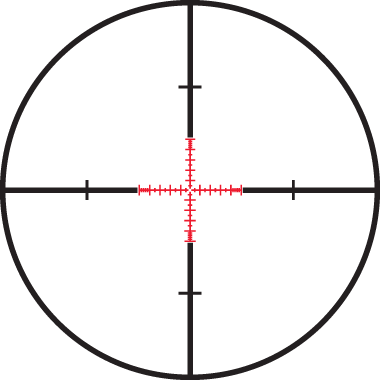 A side parallax adjustment dial allows parallax elimination from a shooting position. Leupold Mark4 Long-Range Tactical Scope LR/T M2 optical and mechanical systems are covered by the Leupold Full Lifetime Guarantee while the electronics are covered by the Leupold Electronics Warranty.